Shower system material: 304 stainless steel brushed nickel finish, concealed brackets design. makes it both modern and clean looking. Hydroelectricity Temperature display that assist you to select the best water temperature(100 degrees Fahrenheit) and can let you know the Time of the shower. This new luxurious shower panel has just newly arrived to North America and it is one of the best shower panels you can find in the market. It qualifies under the ISO-9001 standard, which can only be acquired by products that went through strict quality control and product inspection. 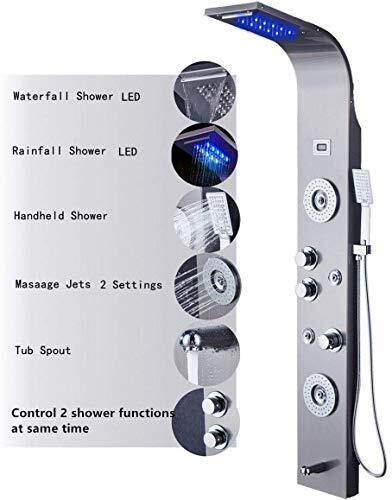 The body of the shower panel is made of high quality aluminum alloy and it comes with several functions, including an overhead shower, a hand-held showerhead, 8 body massage nozzles, and a tub spout. Two controllers are added to control the functions and water temperature. 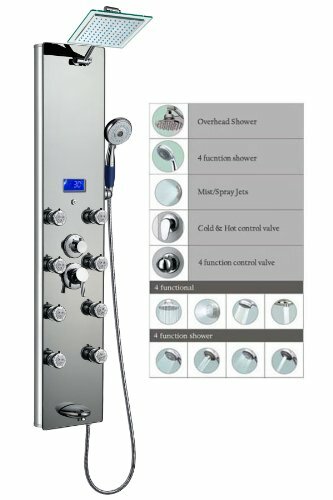 By buying this unique and lavishing shower panel, you would be able to enjoy a higher level of showering experience after everyday's hard work! * Item Size: 52"H x 10"W x 3.5"D (132 x 26 x 9cm) * Package Size: 55"H x 13"W x 8"D (138 x 33 x 19cm) * Gross Weight 32lbs * Includes a rainfall shower head, a handheld showerhead, a tub spout, 8 adjustable body nozzles, and temperature display * Shower panel frame is made of aluminum alloy * 5mm mirror like tempered glass surface * Lightweight and durable * Unique massage panel is designed for flat wall installation * Comes with chrome-plated brass hose * Standard 1/2" plumbing connection * Hot/Cold water hose of shower panel will be connected to water pipe fitting directly * Reinforced pipes on back * Temperature display is powered by AA battery * The minimum pressure required is 28 psi and maximum pressure required 72 psi * Offer 1 year part warranty * All functions work independently to ensure proper water pressure * Easy installation, come with all standard installation accessories * In stock and ship out in 1-2 business days If there are any questions regarding this item or if you have any issues after purchase, please feel free to contact us and we are more than happy to assist you! This new luxurious shower panel has just newly arrived to North America and it is one of the best shower panels you can find in the market. It qualifies under the ISO-9001 standard, which can only be acquired by products that went through strict quality control and product inspection. 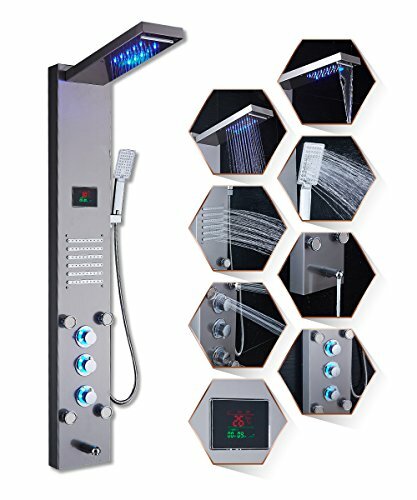 The body of the shower panel is made of high quality aluminum alloy and it comes with several functions, including an overhead shower, a hand-held showerhead, 8 body massage nozzles, and a tub spout. Two controllers are added to control the functions and water temperature. 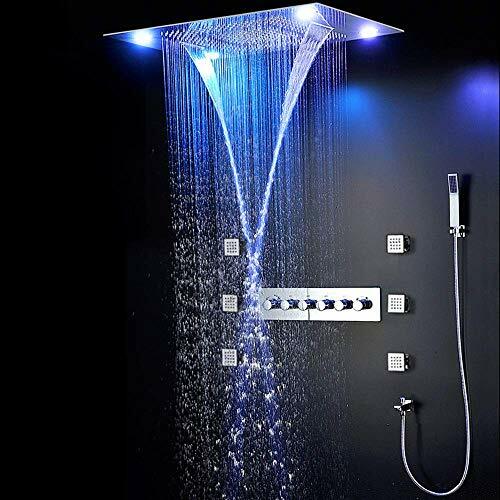 By buying this unique and lavishing shower panel, you would be able to enjoy a higher level of showering experience after everyday's hard work! Perfetto Kitchen and Bath's multi-functional shower panel is a great fit for all body types. Featuring a brushed stainless steel material in black, multiple showering modes are available for the best feeling shower you've ever had. Hot and cold water controls are integrated to minimize messy plumbing and title work for your bathroom remodel. Eight adjustable wet jets can be positioned to any angle for maximum comfort and coverage. 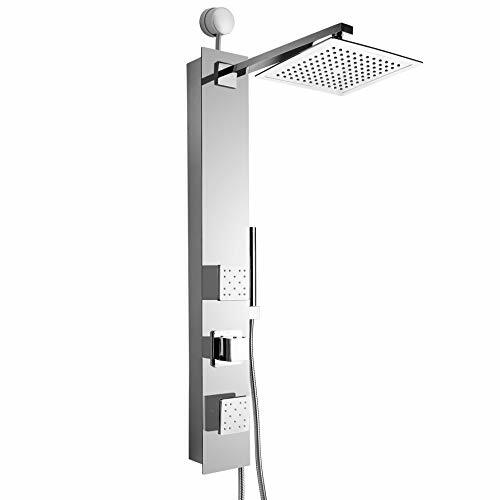 A overhead shower head lets water rain down on your body for a gentle and soothing sensation. For more of an impact, a waterfall outlet can be switched on for cascading water. Great for problem and hard to reach areas, a shower wand gives greater range of mobility and flexibility. Includes 1-year limited parts warranty. Constructed of thick durable stainless steel, the AKDY 39" SP0039 shower panel is built to last. 50 rainfall style nozzles provide water coverage from above, or the user can opt for a waterfall style spout that's built right in. 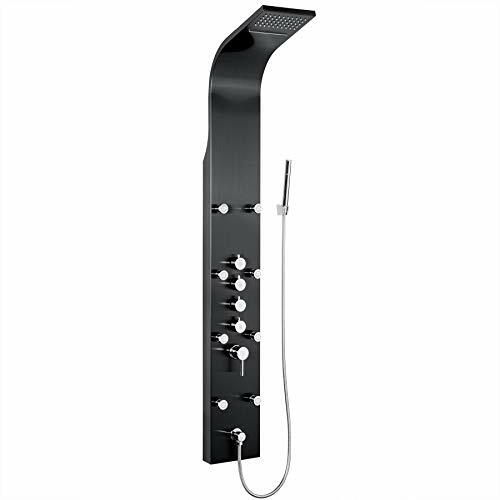 Full of features, this shower panel has two pods of adjustable body spray nozzles. Finally, a handheld shower wand allows for unhindered movement allowing you to put water where you want it. With the new Easy Connect feature, this shower panel is to be mated with pre-existing fixtures, circumventing invasive construction and utilizing the previous water supply and temperature control. Finished in a striking brushed stainless steel, this shower panel is sure to be the star of the show. Using 1/2" standard sizing, this model is perfect and easy to use. Furthermore, this shower panel is covered by a one year parts warranty. 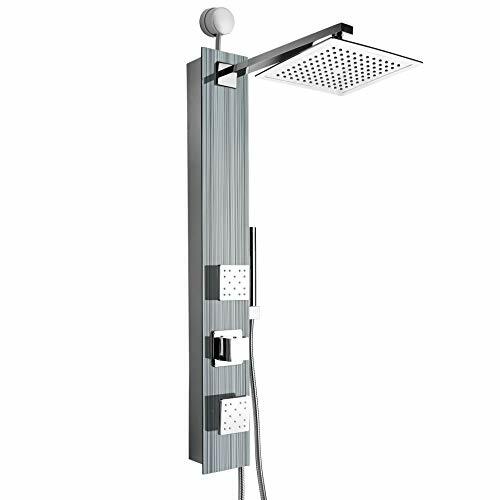 Made to be an all-in-one solution to your shower's needs, our AKDY SP0056 65 in. 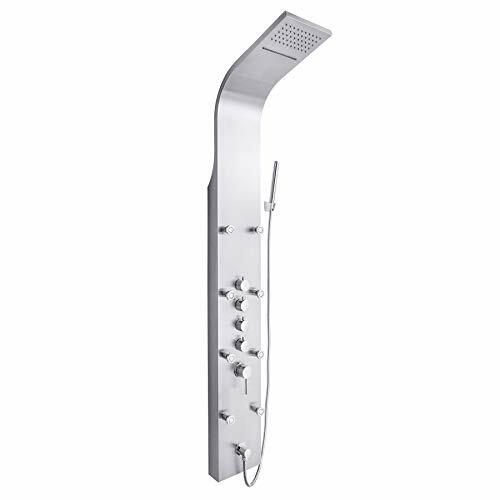 stainless steel shower panel has built-in controls and features multiple modes. An overhead waterfall outlet lets water cascade down, while multiple shower nozzles gently spray your body for a soothing sensation. An included handheld wand keeps your showers flexible and provides freedom for hard to reach areas. All functions can be run simultaneously. This shower panel comes with our 1-year limited parts warranty and is covered against all defects in workmanship. A perfect fit for any bathroom interior, our Perfetto Kitchen and Bath SP0060 35" tempered glass shower panel is an easy choice for any home do-it-yourselfer. Designed to hook directly onto your existing shower head as part of our easy connect system, it makes for a fast and convenient upgrade that requires minimal plumbing. Use your existing hot/cold valve control to get the perfect temperature then use your diverter to transfer over to our shower panel. 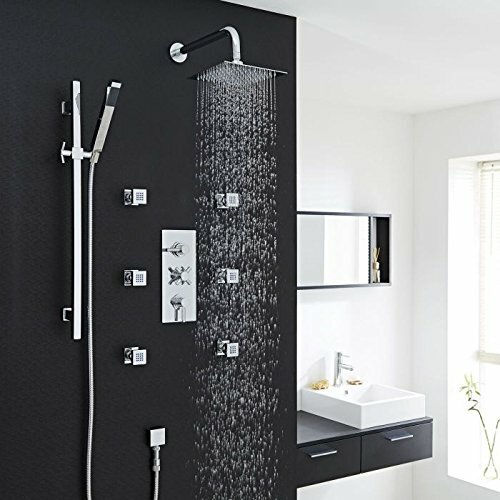 A rainfall style shower head makes showering peaceful and calming, while a pair of body strays propel water onto your body for the ultimate in relaxation. A handheld shower head provides the ability to aim water in the hard to reach places, perfect for those with limited mobility. Tempered glass covers a multi-striped design for a modern and contemporary look. This shower panel uses 1/2" standard plumbing sizing. This shower panel is covered by a one year limited parts warranty. Schluter-SHELF-W is a wall storage system available in brushed stainless steel. 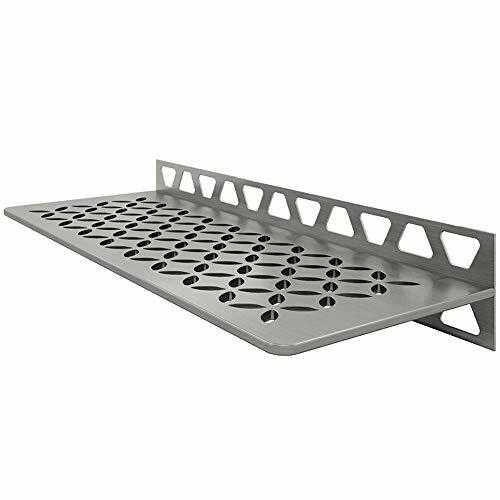 The shelves are 5/32 (4 mm) -thick and features designs coordinating with the Curve and Floral styles found in KERDI-DRAIN and KERDI-LINE drain grates. They can be used in showers and other tiled wall applications (e.g., kitchens and baths). SHELF-W is a rectangular shelf with two trapezoid-perforated anchoring legs for installation on walls in conjunction with the tile. The VALORE VS-1000 Plus is a retrofit shower panel made of quality stainless steel with a fingerprint resistant coating. The VS-1000P's sleek and modern appearance will bring a refined look to any bathroom. It can be installed within 15 min. with no modifications required to your existing plumbing. Enjoy a spa-like experience in the privacy and convenience of your own home. Schluter-SHELF-N is a wall storage system available in brushed stainless steel. The shelves are 5/32 (4 mm) -thick and features designs coordinating with the Curve and Floral styles found in KERDI-DRAIN and KERDI-LINE drain grates. They can be used in showers and other tiled wall applications (e.g., kitchens and baths). SHELF-N is a rectangular shelf that fits the prefabricated Schluter-KERDI-BOARD-SN shower niche. It is installed in conjunction with the tile. Schluter-SHELF-N is a rectangular shelf that fits the prefabricated Schluter-KERDI-BOARD-SN shower niche. 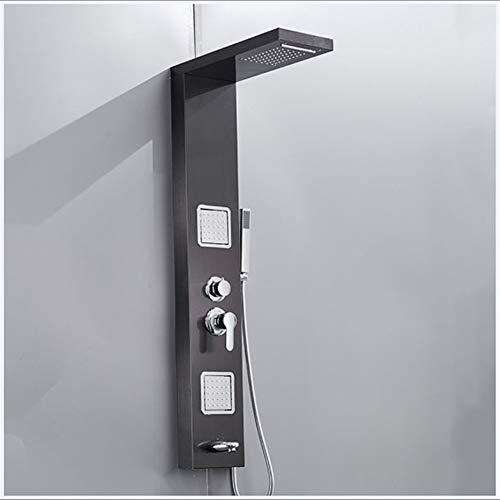 The LED lamp bead is hidden in the shower head, it is not visible from the appearance. 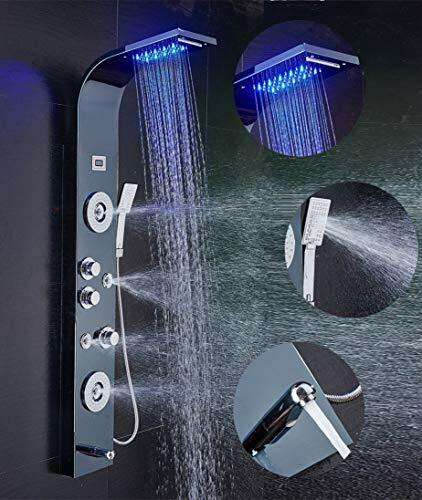 Only after connecting the shower head to water pipes , and open rainfall mode,when the water come out ,the LED will be light up. 0-29 degrees: Blue, 30-39 degrees : green, 40-49 degree: red, 50 degrees and above: red flashing high temperature alarm. The elderlychildren and pregnant women can use. 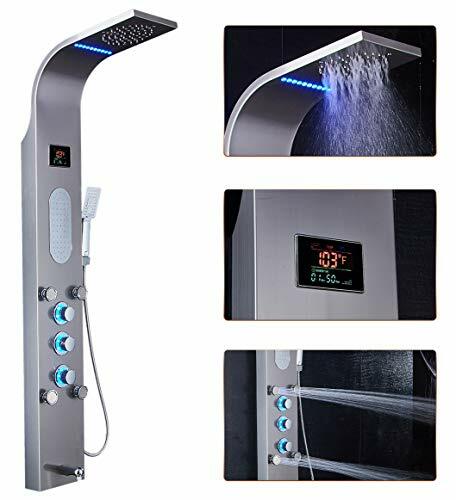 This shower head can experience the true feeling of rain, as well as SPA body massage spray, relieving fatigue and stress. It is your best choice, a choice to enjoy life. Shower System Material: 304 Stainless Steel Brushed Concealed Brackets Design. Makes It Both Modern And Clean Looking. 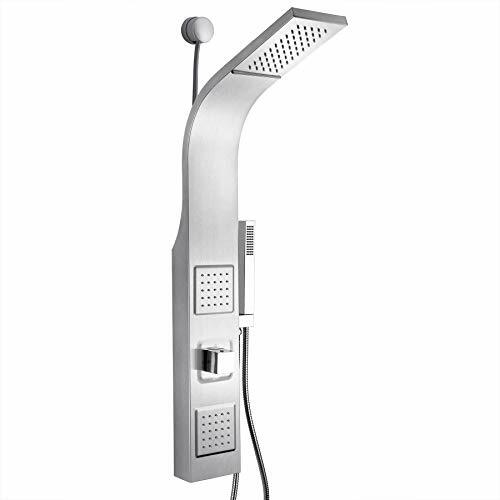 Extravagant Appearance, Mordern Square Design.abs Handheld Shower, Brass Shower Tap,easy To Clean. 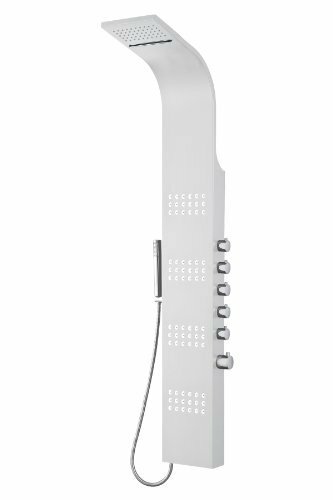 Enjoy a sensational showering experience with Hudson Reed premium interval chrome concealed thermostatic shower panel with head and body jets. Featuring a concealed design for a streamlined look and a chrome finish to blend in seamlessly with any bathroom decor, this shower panel provides smooth and precise control over the flow and temperature of the water. 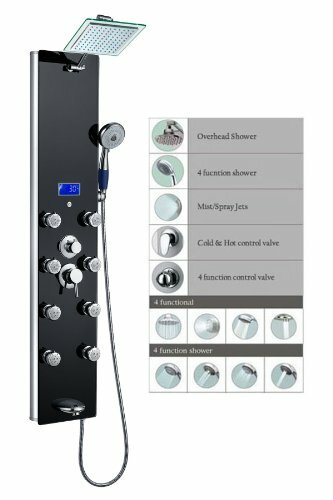 Incorporating anti-scald technology for peace of mind, this shower panel features a separate fixed head with waterfall function, five massaging body jets and a hand shower with hose. The shower panel has been made from stainless steel. 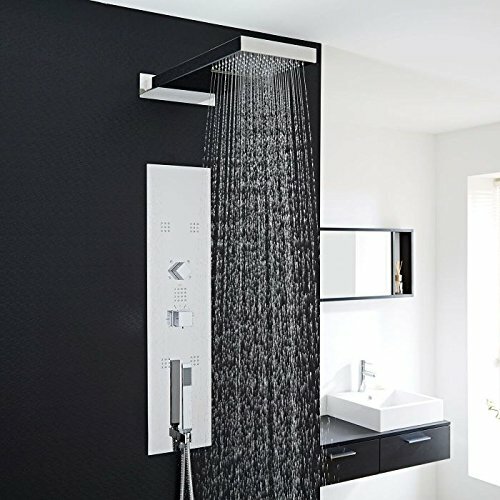 Special Features: Rainfall head - This shower panel features a stunning and relaxing rainfall shower head to ensure you experience only the most luxurious start to your day. Connections: This shower panel features 1/2 Flexible tail inlet connections. Finish: Chrome - This quality Hudson Reed shower panel comes complete in a stunning and classic chrome finish to enchance any choice of bathroom d cor. 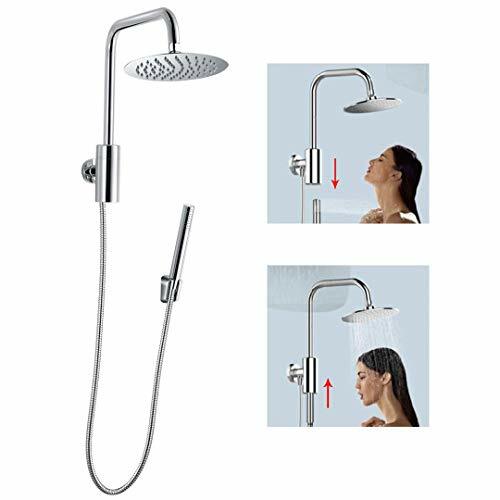 Anti-Scald: Yes - This product features a built in anti-scald device for a safer showering experience and includes a factory pre-set temperature of 104f. The Hudson Reed Tec Thermostatic Triple Shower Valve features beautifully modern lever and cross head controls for premium fingertip control. 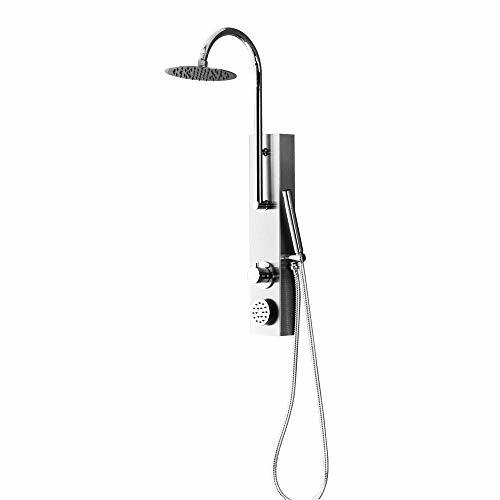 Constructed from brass and with modern ceramic disc technology, this luxury chrome finish minimalist shower valve supplies water to either the 8" rainfall shower head, slim handset or 6 massaging body jets. 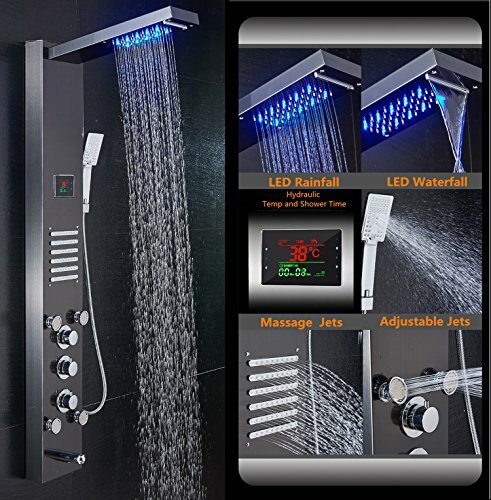 Dimensions: (H x W) 11" x 4 "
Projection from wall : 2.16"
Special Features: Body Jet Sprays - This shower system features spa-like shower body jets to ensure you experience only the most luxurious start to your day. 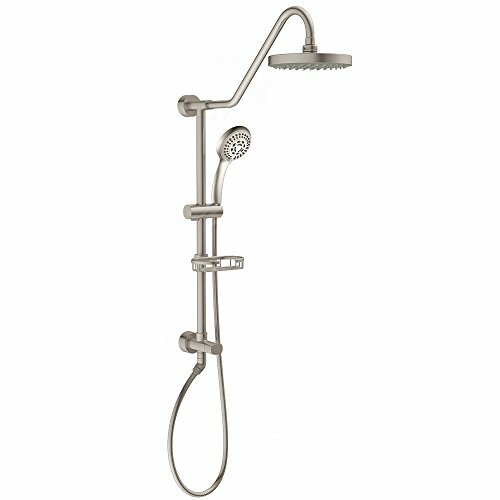 Finish: Chrome - This quality Hudson Reed shower system comes complete in a stunning and classic chrome finish to enchance any choice of bathroom d cor.